This entry was posted in Roads and tagged Cambridge, Streetscape by rich257. Bookmark the permalink. Can we assume that the Wilkin and Felton Rd closures will maintain cycle access? I would expect there to be cycle access. Just for the avoidance of doubt, closing those roads to motor traffic is an idea of mine and not something that is being consulted on. Very constructive comments and criticism.The use of Tenison Road as a through route by taxis also causes difficulties and hazards on Mill Road – at the Tenison Road junction and all along Mill Road as far as the fire station. The traffic along this route is likely to increase (I don’t need a survey to know this!). 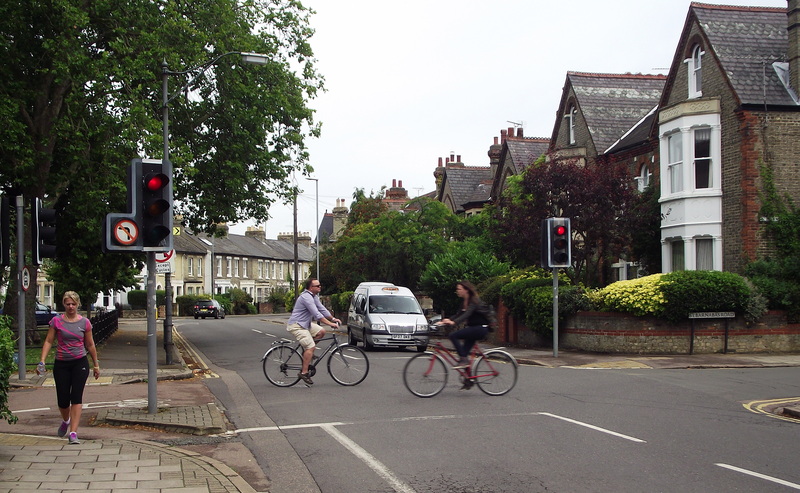 An increasing amount of traffic is also turning right from Mill Road into Devonshire Road – ignoring the unclear prohibition. 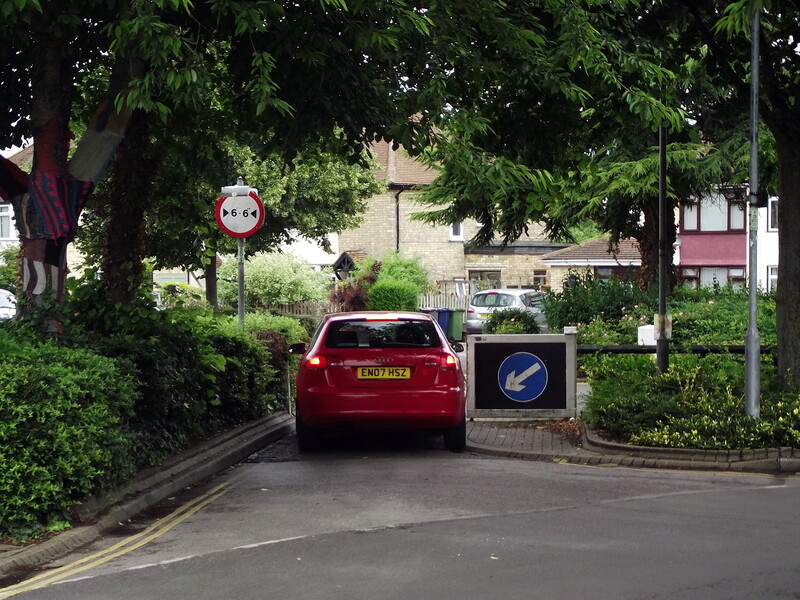 Devonshire Road is (effectively) a one-way street. The Council needs to develop some through routes from the station, which will need substantial demolition and a considerable investment. So be it – the councils have effectively done nothing for traffic since the 1920s – except throttle it – and has increased somewhat since then – it is likely to increase further (again I don’t need a survey to work that one out). Thanks for your comments Stephen. Traffic will increase if left unconstrained, however Department for Transport statistics show that the number of motor vehicle journeys have remained static (nationally) for the past decade. The new Science Park station should take some pressure off the current station, as would an Addenbrookes station that now appears to be being talked about again. Similarly the Chisholm Trail and an eastern entrance to the station could also reduce motor traffic in the area. There is consideration of closing Hills Road north of Station Road to through traffic, and many would like Mill Road to be a no through route. What happens when you close routes is that the traffic evaporates: people find other ways to move about or other routes, so this is entirely possible with political will. The closing of Romsey town and Petersfield to through traffic some 30 years ago vastly improved those residential streets though I am sure there were concerns about traffic chaos at the time. While the post-war plans envisioned a four to six lane overhead ring road for Cambridge (see other post on this site) I am pleased that the days of such ruinous plans seem to have passed. interesting to read that you rank pedestrians in last place in the hierarchy; installing a crossing on the bend in Tension Road. To allegedly ‘improve sight lines’ for pedestrians to cross on the bend, the Council narrowed the road, by widening the pavement. As a result, cars (mainly taxis) now mount the pavement endangering the lives of pedestrians. A single wooden post has been installed on the bend as a ‘safety feature’. Just why a whole line of posts was not installed, as the Council did at Mill Rd end, God only knows! I was taught the green cross code as a child. The 1st point was to find a safe place to cross. Certainly not on a bend in the road where cars mount the curb!! How much of the £800k budget went on this ‘improvement’??? 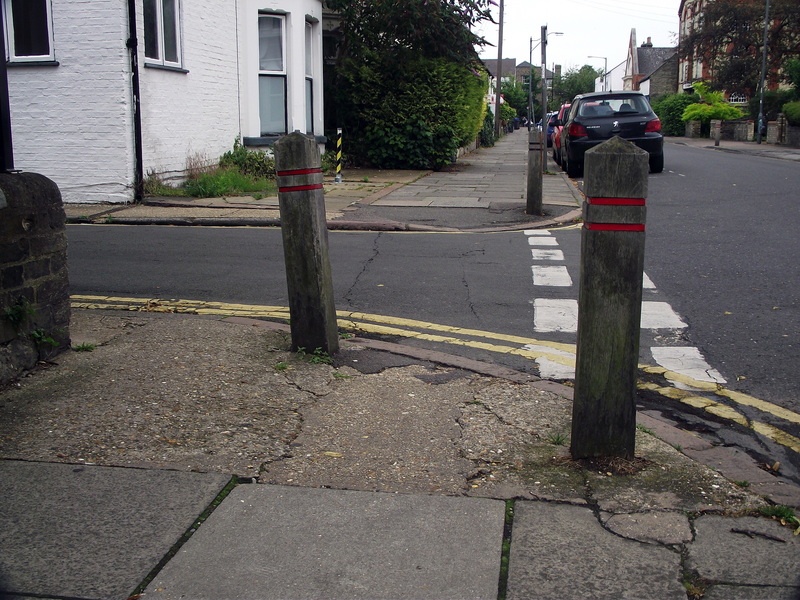 Generally I’m not in favour of bollards to keep cars off the footway because they narrow the footway and create a hazard for the visually impaired. They are basically an admission that something else has gone wrong. 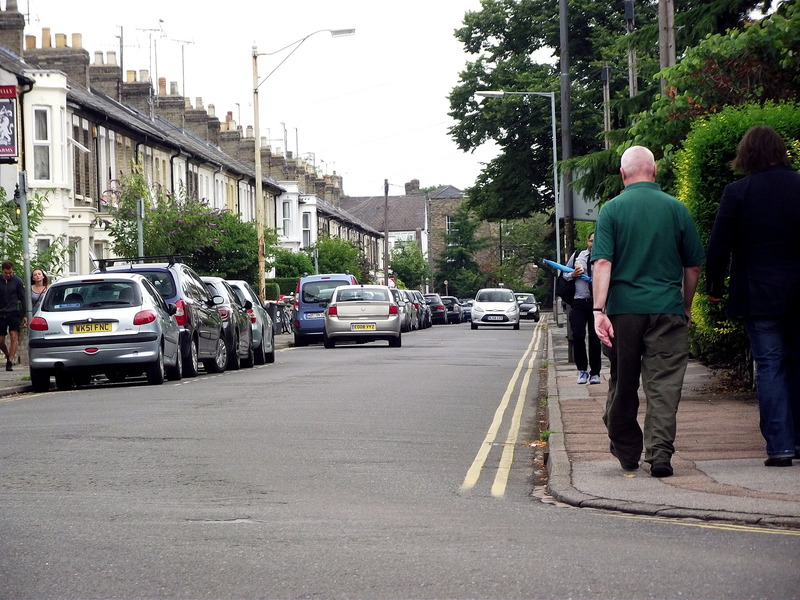 Sometimes raising the carriageway to create ‘raised tables’ means there’s no longer a kerb which makes it much easier for vehicles to drive over the footway, so you have to ask who has benefited from the raised carriageway most? Perhaps it’s just help vehicles claim another part of the road.